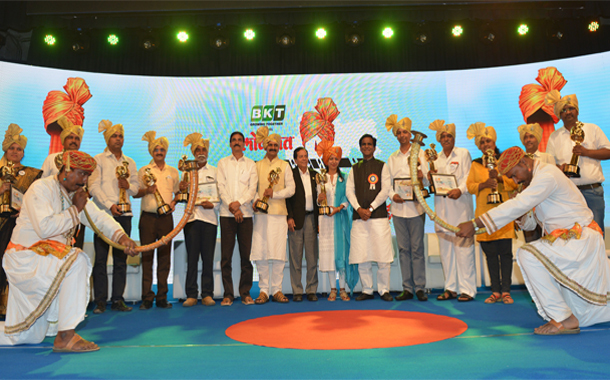 Mumbai: BKT Tyres presented ‘Lokmat Sarpanch of the Year Awards’at the hands of senior ministers in Mumbai on 28th March 2017. The sponsor of the awards is Patanjali Ayurved and is co-powered by Mahindra Tractors.A total of 13 Sarpanchs were conferred with Lokmat Sarpanch Award for their efforts on contributing & controlling the society at the micro level. The awards were bifurcated across various categories with each of them focusing on different aspects of the village’s development.The sarpanch of Sitalwadi (Parsoda) in Ramtek taluka in Nagpur district Ms. Yogita Digambar Gaikwad won the ‘Lokmat Sarpanch of the Year Award’for the distinguished work at her village. The ceremony was graced by Mr. Raosaheb Patil Danve(Maharashtra President Bhartiya Janata Party), Mr. Pandurang Phundkar (Minister, Agricultural), Ms. Pankaja Munde (Minister of Rural Development, Women and Child Welfare), Mr. Subhash Deshmukh(Minister for Sahakar, Panan & Vastrodyog in Government of Maharashtra), Mr. Jayakumar Rawal(Minister for Tourism, Employment Guarantee Scheme), Mr. Arjun Khotkar(Minister of State for Textile, Animal Husbandry, Dairy Development, and Fisheries), Dr. Ranjit Patil(Minister of State Home (Urban), Urban Development, Skill Development and Entrepreneurship), Mr. Makarand Anaspure (Marathi Actor) and Mr. Popatrao Pawar(Farmer Sarpanch).